This map represents the present state of our knowledge of the geography of Europe and western Asia at a period which we guess to be about 50,000 years ago, the Neanderthaler age. Much of this map is of course speculative, but its broad outlines must be fairly like those of the world in which men first became men. 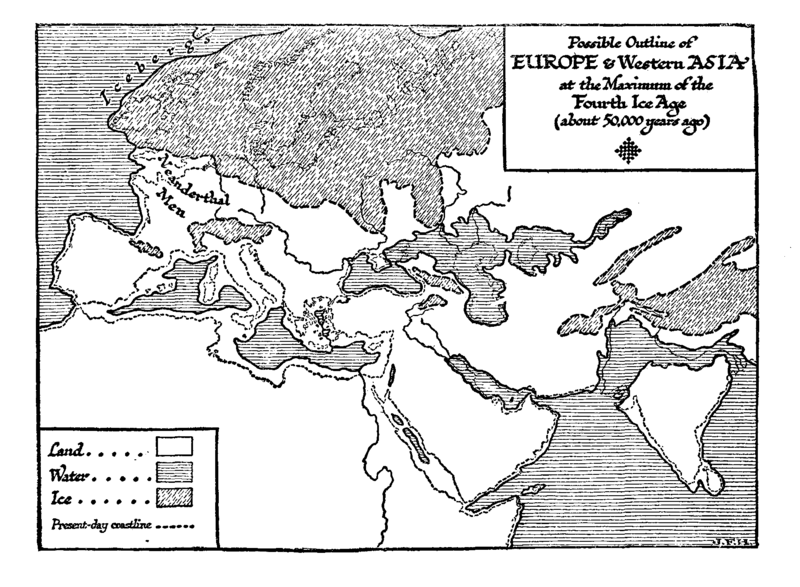 In the time of the Third Interglacial period the outline of Europe and Western Asia was very different from what it is today. Vast areas to the west and north-west which are now under the Atlantic waters were then dry land; the Irish Sea and the North Sea were river valleys. Over these northern areas there spread and receded and spread again a great ice cap such as covers central Greenland today (see Figure 56: Map of Europe and Western Asia 50,000 years Ago). This vast ice cap, which covered both polar regions of the earth, withdrew huge masses of water from the ocean, and the sea-level consequently fell, exposing great areas of land that are now submerged again. The Mediterranean area was probably a great valley below the general sea-level, containing two inland seas cut off from the general ocean. The climate of this Mediterranean basin was perhaps cold temperate, and the region of the Sahara to the south was not then a desert of baked rock and blown sand, but a well-watered and fertile country. Between the ice sheets to the north and the Alps and Mediterranean valley to the south stretched a bleak wilderness whose climate changed from harshness to a mild kindliness and then hardened again for the Fourth Glacial Age. Not merely man was taking to the caves. This period also had a cave lion, a cave bear, and a cave hyena. These creatures had to be driven out of the caves and kept out of the caves in which these early men wanted to squat and hide; and no doubt fire was an effective method of eviction and protection. Probably early men did not go deeply into the caves, because they had no means of lighting their recesses. They got in far enough to be out of the weather, and stored wood and food in odd corners. Perhaps they barricaded the cave mouths. Their only available light for going deeply into the caverns would be torches. What did these Neanderthal men hunt? Their only possible weapons for killing such giant creatures as the mammoth or the cave bear, or even the reindeer, were spears of wood, wooden clubs, and those big pieces of flint they left behind them, the “Chellean” and “Mousterian” implements; and probably their usual quarry was smaller game. But they did certainly eat the flesh of the big beasts when they had a chance, and perhaps they followed them when sick or when wounded by combats, or took advantage of them when they were bogged or in trouble with ice or water. (The Labrador Indians still kill the caribou with spears at awkward river crossings.) At Dewlish, in Dorset, an artificial trench has been found which is supposed to have been a Paleolithic trap for elephants. We know that the Neanderthalers partly ate their kill where it fell; but they brought back the big narrow bones to the cave to crack and eat at leisure, because few ribs and vertebrae are found in the caves, but great quantities of cracked and split long bones. They used skins to wrap about them, and the women probably dressed the skins. We know also that they were right-handed like modern men, because the left side of the brain (which serves the right side of the body) is bigger than the right. But while the back parts of the brain which deal with sight and touch and the energy of the body are well developed, the front parts, which are connected with thought and speech, are comparatively small. It was as big a brain as ours, but different. This species of Homo had certainly a very different mentality from ours; its individuals were not merely simpler and lower than we are, they were on another line. It may be they did not speak at all, or very sparingly. They had nothing that we should call a language. Three phases of human history before the knowledge and use of metals are often distinguished. First there is the so-called Eolithic Age (dawn of stone implements), then the Paleolithic Age (old stone implements), and finally an age in which the implements are skillfully made and frequently well finished and polished (Neolithic Age). 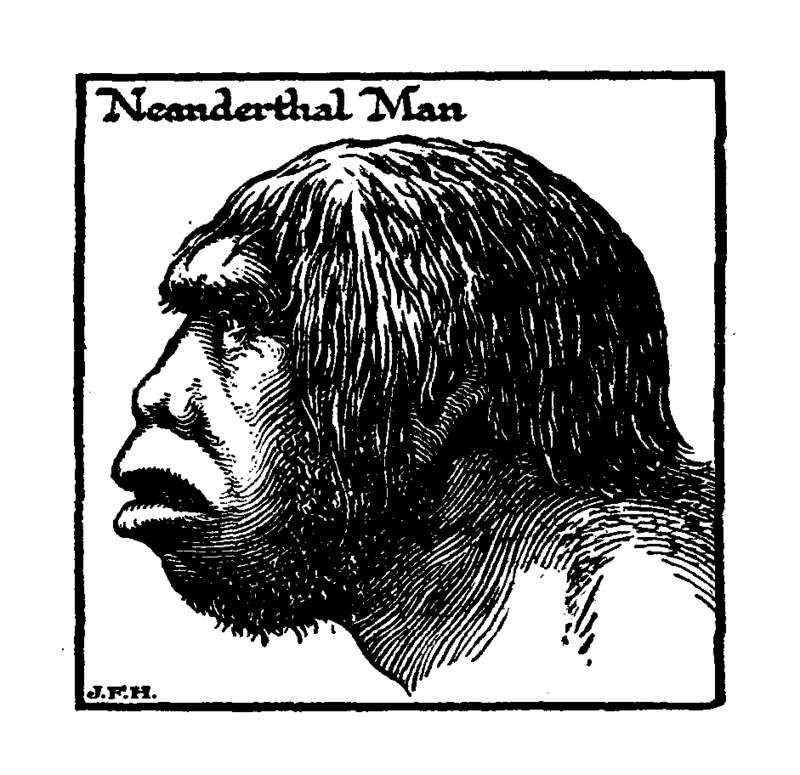 The Paleolithic Period is further divided into an earlier (sub-human) and a later (fully human) period. We shall comment on these divisions later. From Chelles and Le Moustier in France. Osmond Fisher, quoted in Wright’s Quaternary Ice Age .